The DiaEx diamond exchange is a part of the Glitzkoin diamond blockchain project. The exchange is developed on the latest blockchain technology, using the state of the art Stellar resources. DiaEx is poised to bring the first positive change to the diamond industry in decades. Infrastructure And Application: Developing applications on blockchain for commercial use, involves significant investment. The good news is that, the Glitzkoin promoters have funded the entire process, traders can use the platform right from the moment that it is officially launched. The ICO which was completed in June 2018, received an overwhelming response from seasoned crypto participants. Designed by a team of team experts and based on the Stellar blockchain technology, the DiaEx trading platform is open to diamond buyers and sellers of all sizes and located at any point on the globe. Sellers: There is a refundable (one time) charge of $1,000 for sellers to register on the DiaEx platform. This is really not an expense as the seller, would get a complete refund as and when he or she decides to stop trading on the exchange. There is no charge for listing diamonds on the exchange. It is only certified, natural diamonds that will be allowed on the platform. On successful completion of a sale, the seller will pay a charge which would be, just 0.5% of the total value of the transaction to Glitzkoin. This amount will go towards running, maintaining and updating the application. Sellers will not have to deal with middlemen and this, will make their prices more attractive to buyers. The fact that it is only certified diamonds that will get listed on the exchange, will boost the confidence of buyers. 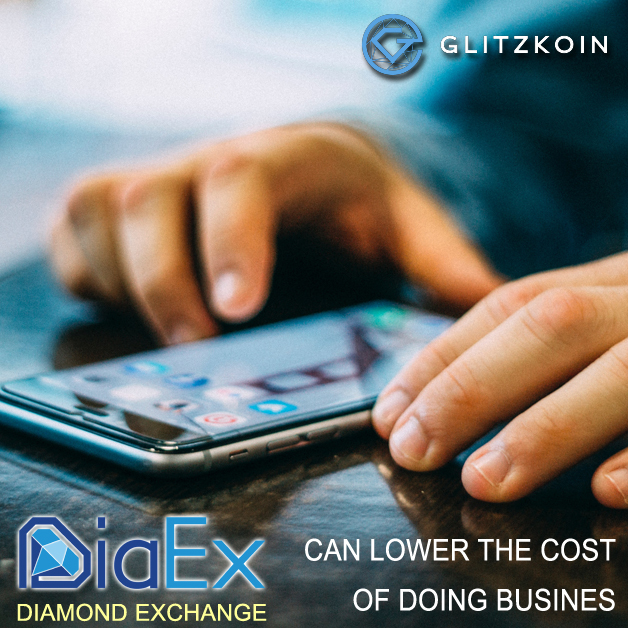 Glitzkoin will actively promote the DiaEx diamond exchange, sellers will not need to worry about developing elaborate marketing networks. Buyers: One of the prime objectives of the Glitzkoin project is to improve, market sentiment for diamonds. It is therefore quite obvious that many features in the DiaEx diamond exchange, have been geared to make buyers feel more confident. Buyers can register on the DiaEx platform at no charge. They can browse the entire inventory of certified diamonds listed on the platform. DiaEx does not allow synthetic or fake diamonds to be traded. This is something that, will go a long way in protecting the interests of buyers. Since there is no room for brokers and middlemen on the platform, the diamond details and prices are visible exactly, as disclosed by the seller. Since sellers both big and small and located, at any point on the globe can list their certified diamonds on the diamond exchange, buyers will have a wholesome selection of diamonds to choose from. Buyers will pay a 0.5% charge based on the value of their purchase to Glitzkoin. This amount will go towards the update and maintenance of the platform. Payment: Conventional trade in diamonds relies heavily on the banking system. Lengthy bank procedures and high banking fees, pose a serious challenge. The problem gets even more severe when casual diamond buyers approach banks to transfer funds. Glitzkoin has implemented the GTN crypto token to settle payments on the DiaEx platform. Using the crypto as the mode of payment, speeds up the process and transferred at a significantly low cost. Glitzkoin: The project was conceptualized by a second generation diamond veteran. The DiaEx diamond exchange is designed to improve efficiency in the multibillion dollar diamond industry. DiaEx has the capacity to improve the market scope for diamonds. This is indeed critical at a time when the glittering industry, has been showing signs of stagnation.